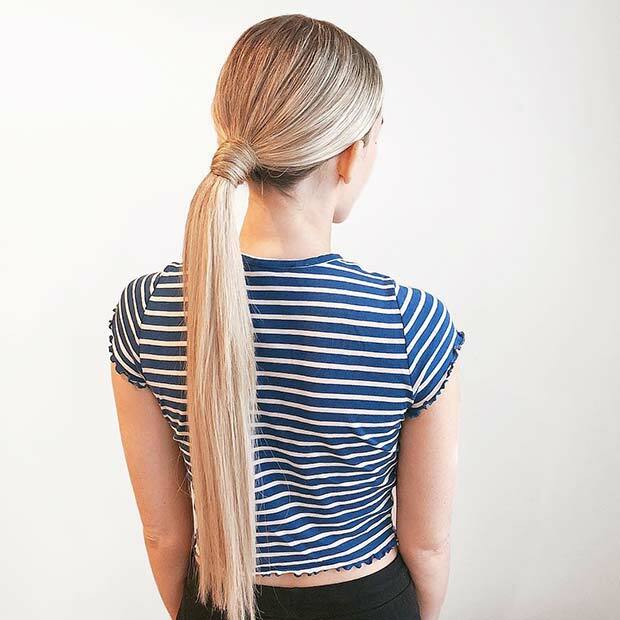 One of the must-have hair trends to try is a sleek ponytail. Usually these hairstyles feature high or low ponytails where all the hair is straightened and is styled very neat. You can of course mix it up a little and add a few curls too. This hairstyle is perfect for the summer season and will keep you looking stylish for any occasion. Not only that, but these ponytails are loved by celebrities like Ariana Grande, Kim Kardashian and more. To give you some inspiration, we have found 21 of the best sleek ponytail hairstyles. Whether you are a hairstyling pro or you are new at creating updos, there is a ponytail for you. First up we have this trendy, sleek ponytail. For this hairstyle all the hair is swept back and the ponytail length is long. The look is finished off with hair wrapped around where the hair tie would be. It is a simple and super stylish ponytail that is easy to wear. You can try a similar hairstyle or choose a shorter ponytail. 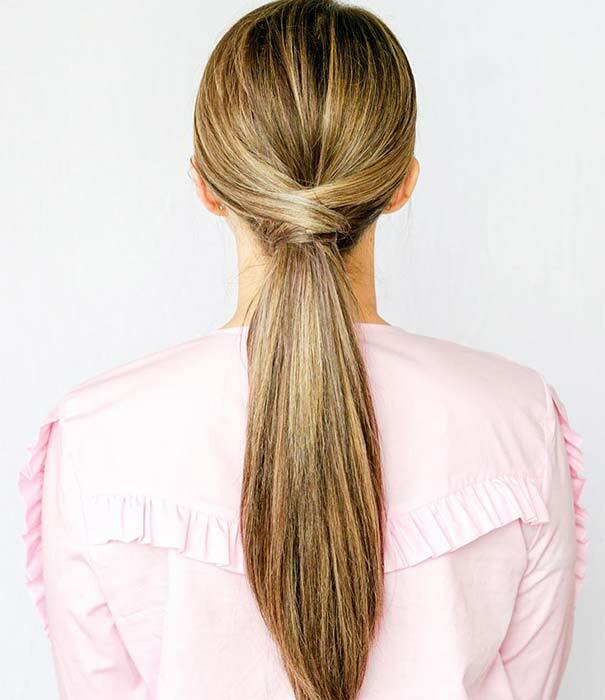 A ponytail can be jazzed up in many ways, one of which is adding a crisscross design. Here we have a beautiful example. 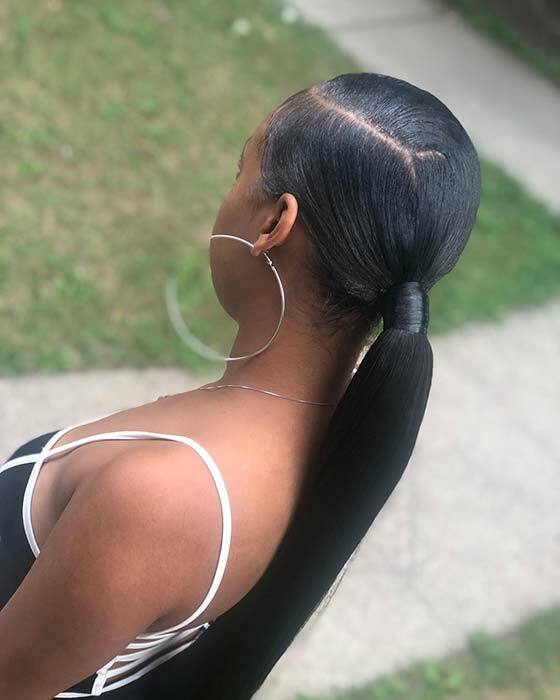 This is a low ponytail with a subtle crisscross design where the ponytail starts. It is a chic look and it will suit everyone. You can check out tutorials on how to create this look online. Recreate this hairstyle or try a more statement crisscross pattern. Next, we have a glam and elegant ponytail to show you. 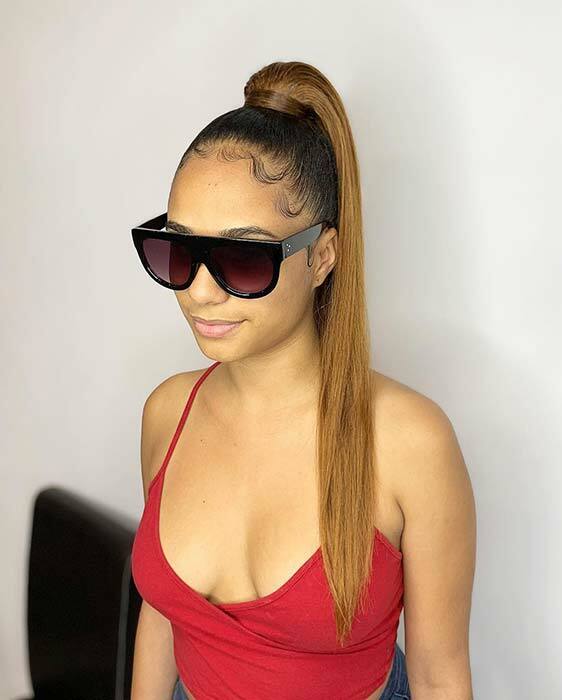 This low ponytail is beautiful, glossy and features stunning curls too. A hairstyle like this will be perfect for a special occasion. Try and create a ponytail like this or you can add more curls. Just keep the hair on the head straight and smooth for the trendy, sleek look. While you’re trying a new hairstyle, why not try a new hair color too? This next hair idea features a blonde sky high ponytail. For this look the hair is black and then it changes to a warm honey blonde shade. The blonde looks trendy and makes the ponytail stand out from the crowd. Recreate this look or try a lighter blonde color. If you are looking for an easy to wear hairstyle that will suit any occasion, then this idea is for you. Here we have a sleek and simple ponytail. The hair is neatly swept back into a low ponytail, there is also a beautiful wrap of hair around the ponytail too. 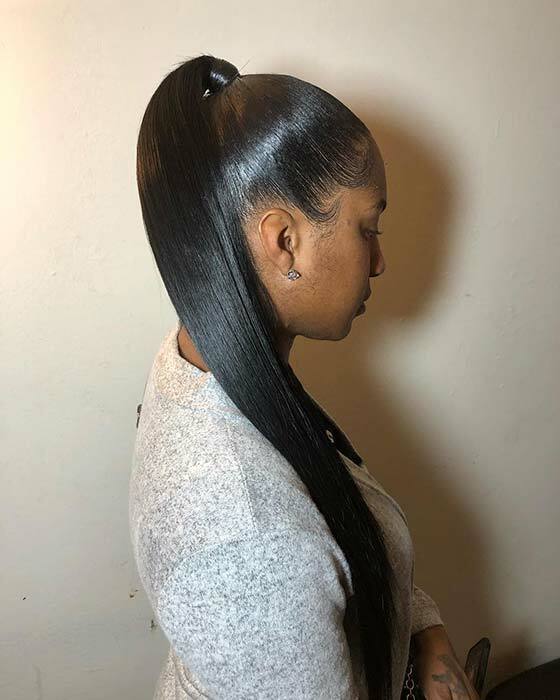 To create the wrap, you can use a small section of the hair from the ponytail and just wrap it around the hair tie, then secure with a bobby pin. 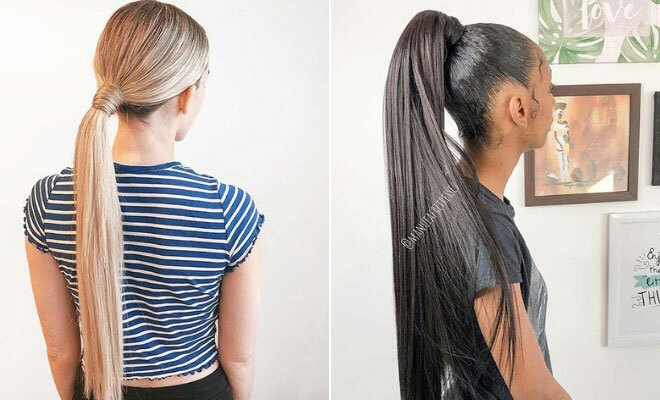 You can make your ponytail look unique by adding braids. Here is a gorgeous example. The hair is styled into a sleek, low ponytail with a wrap of hair. It has been finished off with a small and stylish braid. We love this hair idea because it is simple but statement making. Recreate this look or try adding more braids. Our next hair idea is very elegant. 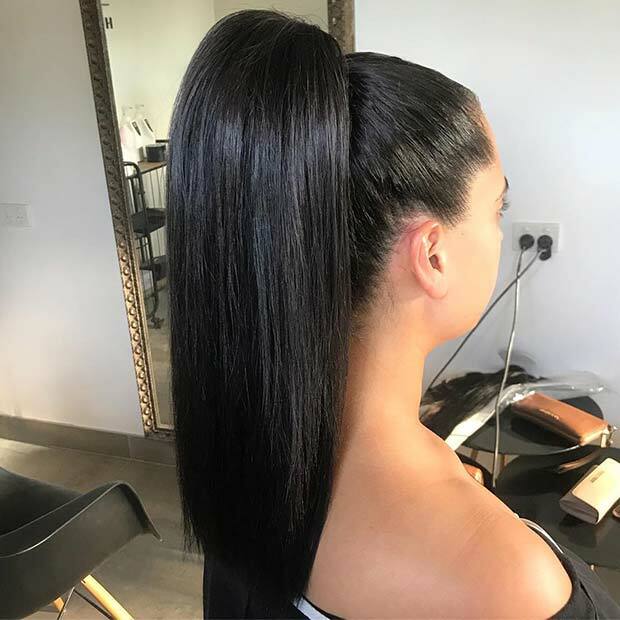 The hair is styled into a high, sleek ponytail. It is very simple but it looks stunning. This is one of our favorites because it is chic, trendy and modern. A hairstyle like this will be perfect for a special occasion or event where you want to wow. You can try a ponytail like this with long hair like featured, or with shorter hair. Either way, it will look amazing. Another way you can make your ponytail look different to the rest is by adding a parting. 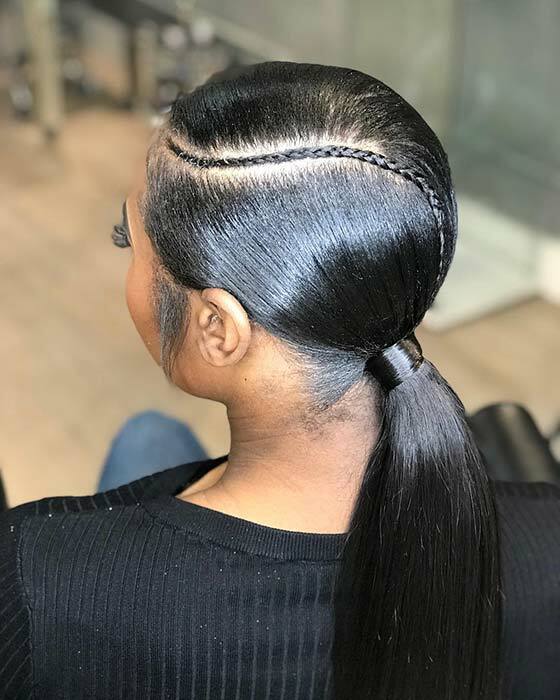 This ponytail features a stylish side parting. As you can see, it is simple but it does make an impact. Try a side part like this or choose a middle parting. A hairstyle like this is best suited to low ponytails. 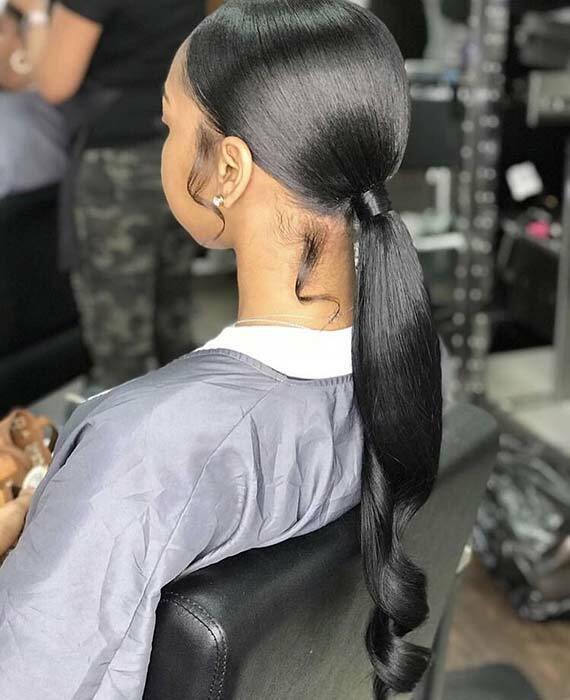 Speaking of partings, here is another beautiful ponytail with a part. The hair is styled smooth and sleek on the head with a middle parting while the ponytail is low and curly. It is a stunning hairstyle and it has a vintage look. A ponytail like this is perfect for a party or any other occasion where you to look and feel glam! Next, we have another blonde ponytail idea. 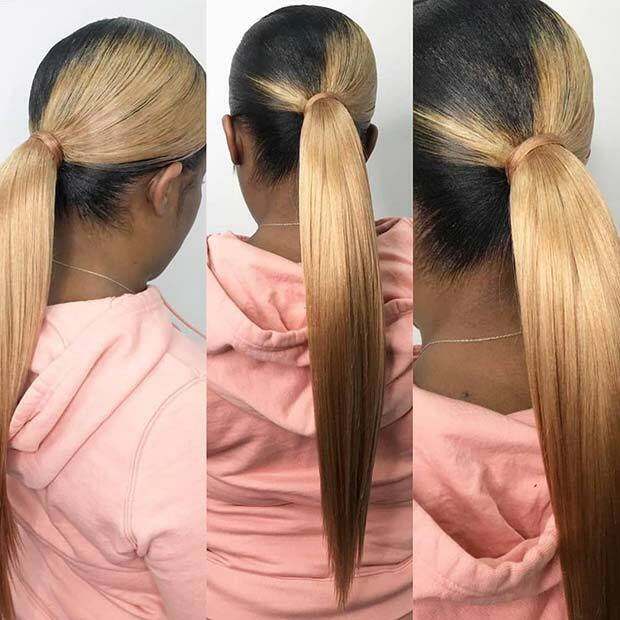 This one features black hair on one side with a stunning shade of blonde added to the other, and the ponytail is blonde too. It is such a unique and creative way to wear hair color. Recreate this stylish look or you can add a color of your choice. Maybe try a different shade of blonde or consider another funky color like red.